HarborLAB Camping Coordinators Ray Tan (l) and Jeff Lim (r). 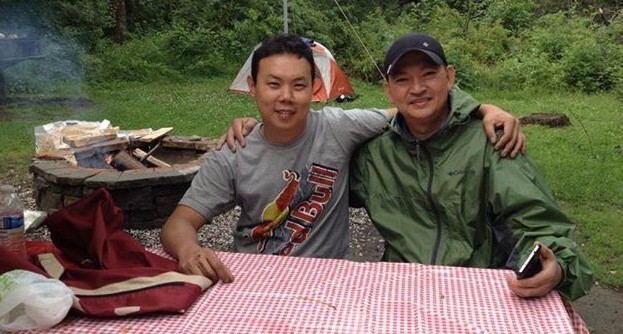 Get to know HarborLAB’s camping coordinators, Jeff Lim and Ray Tan! You might have already met Jeff and Ray through paddle tours, safety support for events, Red Cross training, shoreline cleanups, dock launching, or their many other contributions to HarborLAB. Now their great experience and love of camping will strengthen our programs, and open new possibilities! HarborLAB has two signature camping events each summer where we are the public paddling program providers: Clearwater’s Great Hudson River Revival and City of Water Day on Governors Island. These are our region’s largest annual water ecology gatherings. Our volunteers work hard at these busy events, so Jeff and Ray will help them stay fed and dry at night. Camping will also help ensure volunteer staffing for our Neversink Reservoir paddling program with the NYC Department of Environmental Protection and Catskill Watershed Corporation, so that inner city youth can visit — and learn about — the beautiful, wooded Catskill mountains source of their drinking water. We have a second fleet of 15 tandem boats at the reservoir. Within New York City, camping is permitted on the shores of Jamaica Bay, in the Gateway National Recreation Area. The bay is a prime spot for estuary and saltwater wetlands ecology education. Jeff and Ray will research and propose some other educational camping opportunities in the region for 2015, and even more in the years to come! . Jeff and Ray can’t do it alone. We need volunteers who can help us choose equipment and gear, advise newbies, raise funds, camp cook, share expertise (birds, plants, astronomy, and who knows what else? ), drive vehicles and boat trailers, and much more. Please email volunteer@harborlab.org with the subject “Camping Committee” if you’d like to help them share nature with students, community groups, and fellow HarborLAB volunteers! Camping and boating in the Catskills and NYC-area will excite CUNY students and inner city youth about STEM subjects and environmental science. Let’s do all we can to support Jeff and Ray!